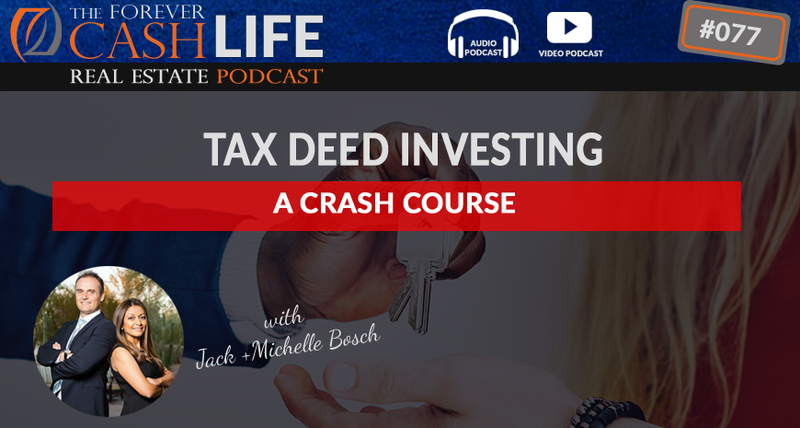 Roughly half of the US States are tax deed states and in this episode of The Forever Cash Podcast, Jack Bosch breaks down everything you need to know about tax deeds: how to acquire them, how they differ from tax liens and what to look out for to ensure you get the best possible deal. The rules differ from state to state, so it’s important that you arm yourself with as much information as possible before making an investment – but never fear, Jack is here to make sure you’re on the right track! The rules for tax deeds are different for each state! Jack: Hey there, Jack Bosch here again with another episode of “The Forever Cash Life Real Estate” podcast. In today’s episode, we’re going to close the loop on about three or four weeks ago when we talked about tax lien investing. Today we are going to cover tax deed investing. All right, tax deed investing is the subject of today’s podcast. Let’s get started. But before we get started, make sure that if you enjoy this podcast, go over to iTunes, give us a five-star review. Click on the five stars, but also leave us a text. What did you enjoy about this particular episode right now? Go there, click on it, leave the review because it allows us to reach more people. The more reviews we have, the more iTunes is gonna put us up in the ranks, and the more people are gonna see this, and the more people we can reach with this incredible message of real estate without houses or hassles. All right, let’s get started. Recorded Voice: Welcome to “The Forever Cash Life Real Estate Investing” Podcast, with your hosts Jack and Michelle Bosch. Together, let’s uncover the secret to building true wealth through real estate, and living a purpose-driven life. Jack: Okay, so here we are. Today we are going to talk about tax deed investing. Again, if you’re watching this, by the way, on YouTube, make sure that you also do the thumbs up. You share it, email it, post it on Facebook. We want you to share this with the world so that the world can find out more about real estate investing without houses or hassles. All right. So now, let’s get going on the tax deed world. So, a few weeks ago, I did an episode about tax lien investing. And tax lien investing was basically allow…I’ve gotten some questions on there that I wanna actually clarify. People always understand that when you buy, say, tax liens, that you own the property. Somebody else asked the question, “If I invest in a tax lien, can I rent the property while I own it?” No. You don’t own it when you have a tax lien. Right? When you buy a tax lien, it’s like a mortgage. It’s a bank lien. It’s like not paying your contractors to fix some things, fix the garage, and then they put a mechanic’s lien on the property. A lien does not mean you own the property. The lien means that they owe you money on the property. You have our lien holder. The bank is a lien holder. The bank can’t rent out the property that you own while they have the lien. You own the property. You live in the property if it’s a house, right? So, no, you can’t rent out the property while you have a tax lien. You’ve gotta understand, a tax lien is not ownership of the property. It is, you paid the back taxes. Somebody had $1,000 or $2,000 of back taxes, they issue the lien for that amount, you pay $2,000 and now you have a piece of paper that says, “Tax lien certificate.” That means that they owe you $2,000 plus the interest, but you do not own the property. However, if you wanna own the property, you gotta attend what’s called a tax deed auction, and that’s what we’re gonna talk about today. A tax deed auction is a auction where the county actually sells the property to the highest bidder. So if you attend a tax deed auction, you are the highest bidder, you pay for the amount, the highest bid amount plus a small fee, then you own that property. And then, yes, you can rent it. You can rehab it. You can build something on it, you can tear something down on it. You can do whatever the heck you want to do with it because you own that property. The only exception is, like, few states where there’s a redemption period after the sale, but I’ll explain that in just a moment. Here’s a standard case of a tax deed investment world. By the way, you don’t need a coaching program for any of this. There’s guys out there selling you tax deeds and tax lien coaching programs, you don’t need that. It’s a very, very simple process. All right, so here’s what you need to understand. When somebody hasn’t paid their property taxes, there’s two kinds of states. A tax lien state, which does not sell the property, right? We got that already, right, earlier? Tax lien is, they issue a lien against the property, and then they sell the lien, and then you own the lien but you do not own the property. Half of the United States are tax lien states. The other half is tax deed states. And those tax deed states are California, for example. Let’s pick California as an example. What other states? Texas is a tax deed state, right. There’s about 20 of them out there. There’s many different tax deed states out there. Now, in the tax deeds, I think, what’s that? Florida for that matter is both, but it’s ultimately a tax deed state. Hawaii is a tax deed state. I think Georgia is a tax deed state, and so on, and so forth. So there’s many of those states. But let’s pick California because it’s the most popular state in the country. There’s lots of land, because we love land of course, right? So, what happens here is, somebody doesn’t pay their property taxes in a tax deed state, the county waits. And they wait until the state statutes tell them that they can take action. So, in the state statutes of California, it says that if somebody doesn’t paid their property taxes, the state has to wait five years. By the way, in Texas it’s only two years. So you gotta look that up, and based on state by state, the rules are different. In California, it’s five years that they have to wait, then after five years, they then go to the court and they get what’s called a right to sell. So the court gives them a right to sell, to then take the property and then sell it at the auctions. So at the tax deed auction in Texas, like the word deed says, you’re getting…the highest bidder at that auction gets a deed to that property. Right? A deed is a document that transfers ownership from one person to the other. So because it’s a deed auction, the actual property transfers. All right? So, get me clear. Lien auction, no ownership. Deed auction, yes ownership. Right? So we got that. So, now, in Texas for example, works a little different, in Texas they only wait two years, and then actually the county, authorized by the state statutes, has the right to foreclose on that property, on that piece of land, on that house, on that commercial property, whatever, on the piece of real estate. So they go and foreclose on it, and after they foreclosed it, when the state now owns or the county now owns that property, they go and sell it at the public auction. So the process is different from state to state. You gotta look into that, but bottom line is, then once they…either they get the right for sale, or they actually foreclose on it, either case, they then put up an auction. And then at that auction, the properties where the owners have not paid their property taxes for long enough, that they could get that right to sell, or where they could go to the foreclosure, they then take those properties. They’ve gone through that step, and put them up for auction, advertise it on the website, advertise in the newspaper, make a big deal out of that, fill up a room with people. Sometimes it also happens online by the way, but in many cases, it’s still physically. And you can register as a bidder. You need to bring cash, or certain amount to register for a bidder, and usually like $200, $250 or so, and then you get to bid on that property. And let’s say there’s 100 bidders in there, and there is one property and there’s 10 people bidding, and you end up being the highest bidder. Bidding starts at 5,000 ends up at $35,000. You’re the $35,000 high bidder, the gavel comes down, you get this property. You now have usually between one and seven days to pay for that property, and then they give you, literally, the next day or within a couple of weeks they give you a deed, usually a treasurers deed for that property, and now you have a deed to that property, and you own that property. You now are the owner of that property after the auction. You paid for it, you’re the brand new owner. And in any state, in most states that end up through this, you now have immediate right of possession. So if it’s a house and somebody lives in there, you can evict them. If it’s a empty, vacant lot, you can start going on there. Start building. Start [inaudible 00:08:12] your building permit. Do anything you want to do with it. You can tear down stuff on it. It’s your freaking property. That’s how it works. That’s as simple as that. You just, as an investor, what you wanna do know though is, you want to know whether or not the property that you’re bidding on is going to be a good property. So, as an investor, now that you understand how this works, let’s say you get a list from the county that shows when the auction comes up, which properties are listed on the auction. So, what you wanna do is, first of all, you wanna look at your budget. If you have $50,000 to invest, don’t start bidding on properties that have a minimum bid of 60. Right? It doesn’t make sense, because they’re gonna bid up higher, and you don’t have the money to buy it. If your budget is a million dollars, then go for those, right? Remember though, the county will not give you time to get bank financing for that. This is a cash auction. In many cases, you have to pay within 24 hours. So now that you have done that, you go, attend the auction. Now, you wanna attend the auction, you get the list of them, you filter down the ones that are within your budget, you filter down what type of property you want. Do you want commercial or not commercial, you want land or not land, you want houses or not houses, right? Filter them down by what you want, then you go, make sure that you do a little mini-title search. You see, are there any kind of, like, IRS liens on there? They usually fall off, or there’s a process to make them fall off, but are there any kind of city assessments on there that would be continued, that would not be wiped out? Are there any mortgages out there? So the bank, usually what they do is, they actually act quick enough. They come in a few days before the auction, they pay off the back taxes, they tag it onto the loan, and talk to the seller and to the owner and say like, “Hey, what’s going on? Why have you been not paying property taxes?” And they force that process to happen, right. So therefore they take that property off the auction. So what I like to do is, I like to keep an eye on the properties with mortgages, but I don’t like to go usually bidding on them or prepare a lot for them, because 99% of them usually have been redeemed and pulled off the auction just days before the auction, because the bank realizes, “Okay, nobody is paying these back taxes. If we don’t pay them, we’re gonna lose our mortgage.” So they come in and they pay the back taxes, which takes the property off the auction. All right. So now, a couple of things you wanna do, you wanna make sure that the property is not kind of like on the Environmental Protection Agency, hazardous material list. Right. You just go on the epa.gov and search for the address, all right? And if you find it, then it’s something there, you don’t wanna bid on that thing, because you don’t wanna buy an environmentally challenged property, right? You also wanna make sure that you do a drive-by before you attend the auction, or have somebody drive by, because that pretty picture on Google Earth or Google Maps of that nice house, that house could be burned down, and that’s why they haven’t been paying property taxes. So make sure you do a drive-by the day before, so that you can have reasonable assurance that the properties you’re actually bidding on still exist, etc., etc., etc., and then you buy the property, and then you own a property. It’s as simple as that. Just a couple of extra kind of rules that I wanna tell you about. There is a few states where the right of redemption exceeds or goes beyond the actual auction date. So what does that mean? As I mentioned here, it’s like, for example, look at California. For the first five years that somebody doesn’t pay property taxes, the back taxes just accrue more and more and more with fees and penalties and interests and so on, but nobody can do anything about it, because the statutory right of redemption is five years in California. Texas is two years. So basically in Texas, you have two years, or in California five years, that the owner can come any time that they want and just pay the back taxes, and redeem those tax, or, like, pay it all off. Well, typically, that time frame ends, either in Texas for example, when the foreclosure ends, so the day the foreclosure ends, typically that ends in most states, like in many states where they’ve actually foreclosed on it. Once a property is foreclosed on by the state, the owner can no longer come back and redeem it. Or, in the very latest case in most states, by the time, the day of the auction, when that gavel falls and somebody buys that property at auction, in that moment, the right of redemption ends. So in California, if somebody…For five years nobody can do anything. In the sixth year, the county goes and gets that right for sale, then it schedules the auction. Literally, the owner of the property has until the 5 p.m. the day before the auction to still come, bring the money, and pull the property off the auction, redeem it. But if that property sells at auction, that day of the auction it sells for $100,000 let’s say, that property, the owner cannot come the next day and still redeem it. The day of the auction, the redemption period is over. In Texas though, and in Hawaii and a couple of other states, that is different. In Texas, there is a redemption period all the way to the day of the auction, and even for six months after the auction. So Texas, literally, you could go and bid the $100,000 on a house that had, let’s say $20,000 of back taxes, and it went up to $100,000, let’s say that property is worth $180,000, so you got it at a good price, right? You got it about 60% of market value. And so you were getting ready, you wanna rehab that place, you cannot really rehab it until another six months have passed, because during those six months, the original owner could actually come and pay the $100,000 plus a penalty. They would have to pay, I believe, a 25% penalty. So they would have to pay $125,000, which you get that penalty, but then they could still pay the property, take the property back to them and redeem it. And yes, you can do that. Right? You can literally go and buy redemption rights from the people that have actually sold the property or lost the property at auction. So if you paid $100,000 for $180,000 property, and you pay this seller, the person who lost another $5,000, now you have a total of 105 in the deal, but now you own the property, and they sold you the right of redemption. So now you own the property and the right of redemption. Nobody else can redeem it anymore, and now you can go and get your building permit, and build on it, and rehab it, and things like that. So there’s always ways around that, but the key is, you gotta first of all be aware that that these things exist. So, therefore, based on what I said, it’s, again very simple. Tax deed is, somebody doesn’t pay taxes, the county, you know, forecloses on it or gets the right to sell, puts the property up for an auction, high bidder gets the property, wipes out the mortgage, wipes out any other liens, they own the property free and clear, Except for…there’s only the case that in a few states, there’s the redemption period beyond the sale, which limits your ability to do something with that property. So if you’re aware of that, you can go around that, you can go buy the redemption rights, you can play some games like that. But in essence, that’s how the tax deed system works, right? So, that’s how it works. I hope you enjoyed that. This is just a quick overview. Obviously there’s much more resources on there on our website, landprofitgenerator.com, because we have bought land…we have actually bought pieces of land at tax deed auctions for $1,200 and then went and sold it for $10,000, $15,000. Without properties, one of our students bought a property in a tax deed auction for $600, and then literally sold it for $60,000. Now, these are not typical cases. Usually you pay a little bit higher prices on them, but there’s definitely deals to be done. It’s a variation of what we already do with our land, where we send letters to the owners, but it still works. It works very well in conjunction with it, as you add multiple tools to your tool belt. So with that, thank you very much. Again, give us a five-star review. The link, again, different links to the things that I mentioned is in the show notes. If you’re watching this on YouTube, it’s in description right here below. Go over to iTunes if you are listening to this on iTunes. Give us a five-star review. If you’re watching this on YouTube, spread the word, do the thumbs up, share it with others, and then, again, check us out on our website. The link is right below. All right, thank you very much. Bye bye.